Q: What cleaning techniques will you use? A: The experts will wash your windows with proven water-fed pole gadget or use sturdy ropes and cherry pickers to clean high-rise premises. We also offer in-house window cleaning in Stanley, carried out with the standard ladders and squeegees. Q: What are the merits of using a water-fed pole? A: This convenient tool allows the Stanley window cleaners to polish any skylight, sash window, French door, and other pane types on any four-storey home or office. Q: Why don't you wipe off the remaining water once your work is finished? A: It's simple – we won't wash your windows with regular tap water. Instead, the pros will remove the grime build-ups with distilled water that won't mar your panes once it vaporises. Q: Do I need to prepare beforehand for the Stanley window cleaners' arrival? A: You'll need to find a free parking space within 30 metres from your domain and on the same side of your street. You'll also need to grant the team with full access to your property. A: Yes, our services are covered by an extensive insurance scheme. In addition, the pros are certified to polish windows big and small, single or double, as well as French doors, door panels and even conservatory roofs. A: Absolutely, but only from outside surfaces. Q: Can you shine commercial properties as well? A: We will happily treat any four-storey or multistorey commercial property. We can also provide you with other maintenance choices, such as gutter cleaning and pressure washing. After going through lots of client feedback, we've altered our window cleaning Stanley's charges. Now, you can hire our service at prices that are nothing short of competitive! For further information, please take a look at our price table below. With window cleaning in Stanley, we can increase the appeal of your property even if it brushes the clouds above. Let's see what you'll get once you go for our flexible service. For exterior window rinsing, the Stanley window cleaners will utilise a extendible water-fed pole. A water pump inside the team's van will send filtrated water up the hose and out of a brush-head extension. The water, in conjunction with the brush-head, will undo any traces of mud from the casements of any four-storey building. With rope access window washing, the experts will use safe abseiling tools to reach even the uppermost storeys in your commersial or home property. We possess all needed COSHH documentation and risk assessment reports and can send them to you in a moment's notice. Also, we frequently check the cleaning gear to ensure that your appointment will go without any complications. And to wipe every interior corner of your glass surfaces, the experienced team will use the classic squeegee and ladder cleaning approach. Over time, we've responded to the washing calls of customers from many nearby regions. As a direct result, we broadened window cleaning Stanley's horizon and you can now see our cleaning vehicles in the locations below. 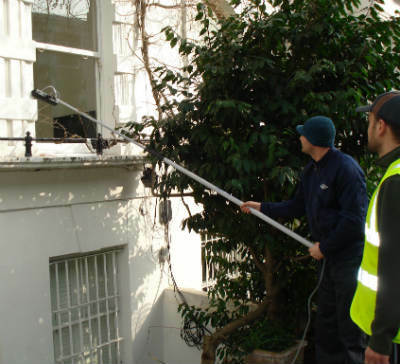 Alternatively, get a free instant quote or order affordable window cleaning services Stanley SW10 online, through our web site.